This month my parcel came from Laura over at Foodie Laura. I usually give spicy food as one of my preferences, and this box happened to be an international spice fest! I haven’t actually tried anything yet but I am really looking forward to doing so. Sri Lankan duck curry. Now this sounds delicious as we love duck but rarely ever have it, so I’m going to treat us to some duck this week and have it for dinner one evening! lamb Rogan Josh. this is one my favourite Indian curries so I was delighted to find this. (I do love cooking curries from scratch but sometimes it’s nice to have it all ready to just chuck together!). some more Spanish paprika – I now have quite a collection of this as it seems to be a running theme! Korean gochugaru powder. I actually had to Google this one and it’s a red pepper powder, so I will be trying some new recipes with this. some colourful tapioca pearl mix. I will be making some yummy desserts with this! (Hubby thought it was ice cream sprinkles!). 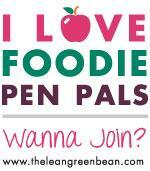 If you wish to find out more about Foodie Penpals and join in, visit Rock Salt for more details.